The new Town Hall Station at the southern end of Swanston Street will improve access to some of Melbourne's most iconic and important tourist destinations including Federation Square, Southbank, the Arts Centre, St Paul's Cathedral and other culturally significant landmarks. 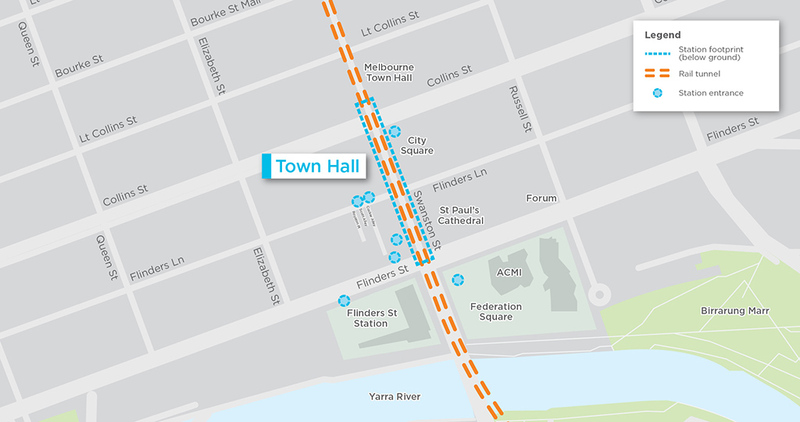 The new Town Hall Station will be located under Swanston Street, between Flinders Street and Collins Street. It will include an underground passenger connection to the platforms at Flinders Street Station, allowing commuters to conveniently interchange between Metro Tunnel and City Loop train services. Passengers will access the station from seven entry points, at City Square, Federation Square, the Degraves Street subway, Flinders Street, Swanston Street, Cocker Alley and Scott Alley. They will move between the new station and nearby Flinders Street Station platforms via a direct underground connection to the Degraves Street subway. Town Hall Station will be a gateway to some of Melbourne’s most popular landmarks and destinations, and the surrounding precinct will be transformed to take advantage of nearby laneways and open spaces. Following construction of the new station, City Square will be returned to the community as a public gathering and events space. 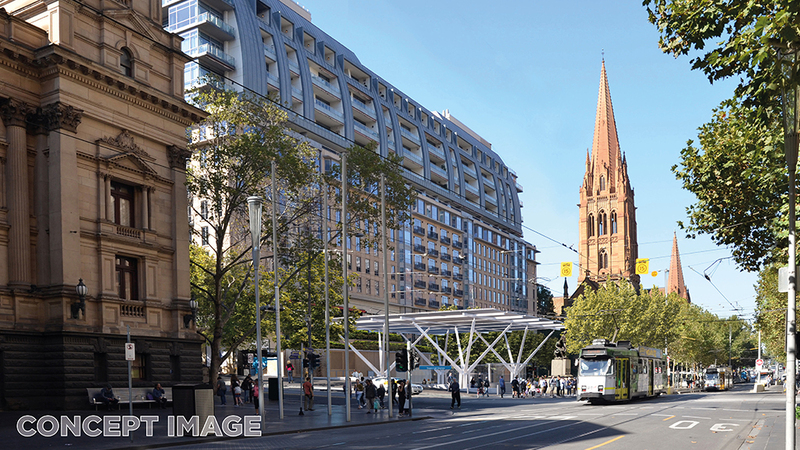 The station entrance at the northern end of City Square will maximise views to Melbourne Town Hall and Collins Street and a rebuilt Mockridge Fountain will be integrated into the entrance structure. A row of trees on the Collins Street side of City Square will provide shade. Open space will be available to the centre of City Square for functions and celebrations. 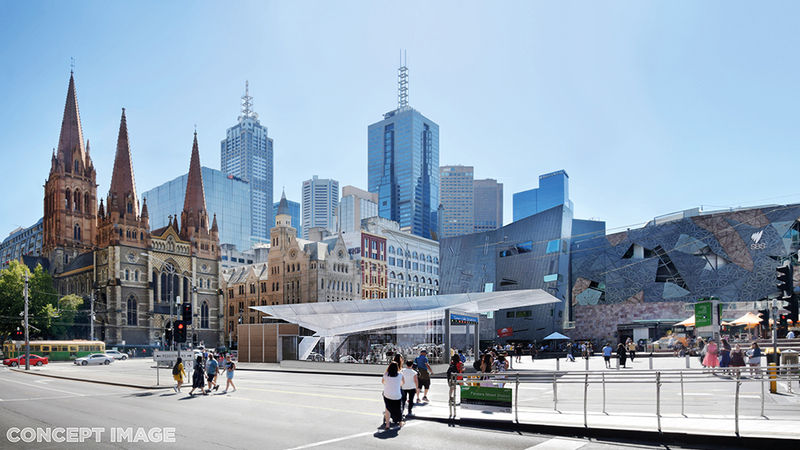 Raised edges along the square will provide casual seating with views to St Paul’s Cathedral and Melbourne Town Hall. Shops and cafes, including space for outdoor dining, will be included in the new City Square, and the Swanston Street side of the square will be revitalised with new trees. Under the plans, Flinders Lane will become a shared street adjacent to City Square, with a raised surface to increase the scale of the square and link it to St Paul’s Cathedral and Chapter House Lane. The Town Hall Station precinct will connect a vibrant network of local laneways, opening up new pedestrian routes and evenly distributing foot traffic around the new station. Existing laneways at Cocker Alley and Scott Alley will be revitalised and extended to provide a direct connection into the new station development and through to Flinders Street, and the iconic King Neptune sculpture by Charles Bush will be preserved. Around the precinct, street improvements include wider pavements, more trees and increased seating. 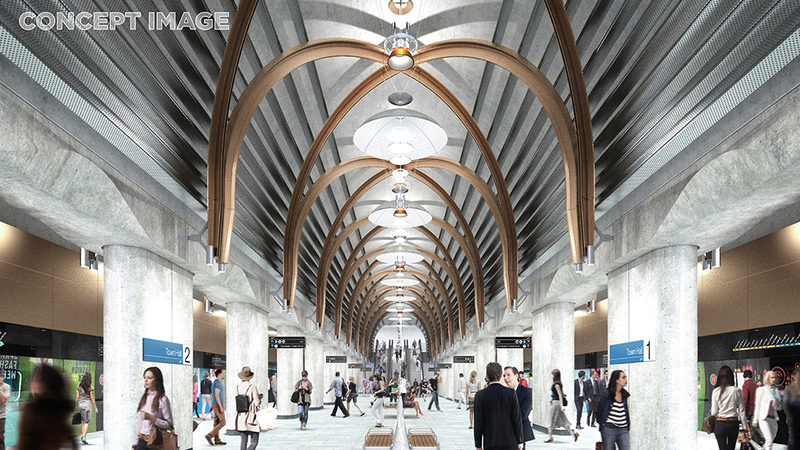 The existing Campbell Arcade is the proposed location of an underground pedestrian connection between Flinders Street Station and the new Town Hall Station. 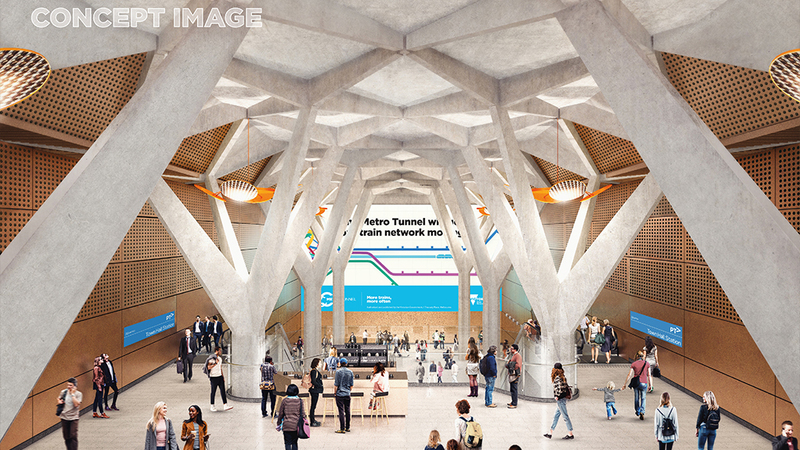 The proposed connection minimises impacts to heritage aspects of the main Flinders Street Station building and will reduce crowding on the Flinders Street Station concourse by taking passengers directly to platforms at the station. Subject to relevant approvals, major work within Campbell Arcade is not expected to start until mid-2019, after all the current tenancy leases with City of Melbourne have expired. A direct underground connection into Flinders Street Station via the Degraves Street Subway. An entrance at Federation Square to improve access to this important civic space as well as the Yarra River, Birrarung Marr and beyond. A station entrance at City Square to reduce pedestrian congestion along Swanston Street and relieve pressure on the Flinders Street/Swanston Street pedestrian crossing. Safe interchanges with nearby tram stops on Collins, Flinders and Swanston streets. Trees will be reinstated along Swanston Street, between Flinders Lane and Collins Street adjacent to City Square, and a single row of trees will provide shade to the Collins Street side of City Square. Trees will be planted directly in garden beds or lawn areas with large soil volumes, and in paved areas with trees that can take in stormwater to provide passive irrigation and water treatment. Water sensitive urban design principles have been integrated into the design of Town Hall Station to reduce flood risk to the Elizabeth Street catchment, reduce stormwater runoff and provide passive irrigation to plants. At City Square, views of the Town Hall clock tower and St Paul’s Cathedral will be maintained. The Burke and Wills monument will be reinstated in City Square, and public artworks including bronze dog ‘Larry LaTrobe’ will be returned.